This is our favourite quiche to eat – perfect with a side salad and new season potatoes! 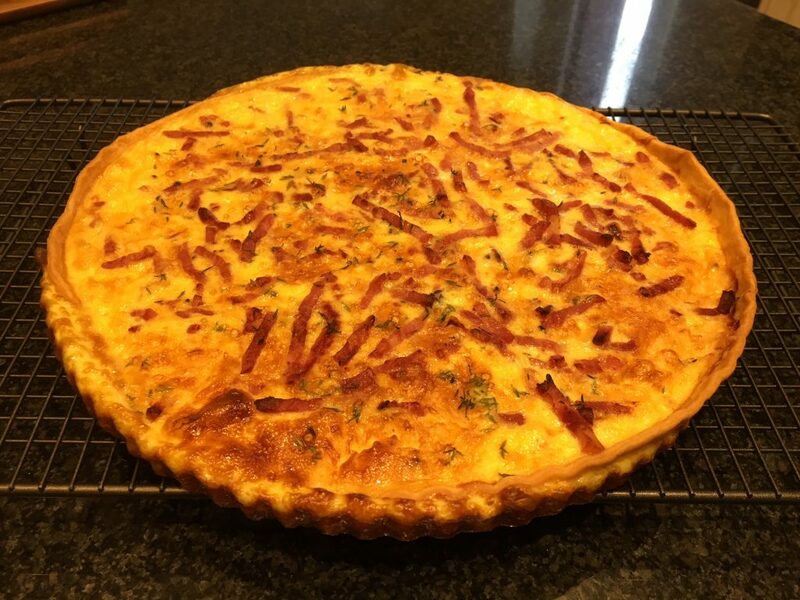 Whilst you may think it is typically French, the origins may actually be German as “Lothringen”, today Lorraine (in the east of France), was a medieval kingdom of Germany… and the word quiche derived from the Germanic word “kuchen” meaning cake! You will need a 22cm (8 1/2 inch) fluted quiche/flan dish/tin; baking parchment and baking beans. Heat your oven to 190c. If you don’t want to make pasty, buy a ready-made one from the supermarket, if it’s not pre-rolled you need to roll it to approx 25 cm in width. Line your dish/tin with the pasty, carefully pushing it into the shape of the tin – cover with parchment and then the baking beans and pop in the oven to blind bake for 20 mins. Whilst the pastry is in the oven, gently fry your lardons/bacon in a little olive oil until cooked (but not crispy) – remove from the oil and drain on kitchen paper to remove the excess fat. Remove the pasty case from the oven – remove the baking beans & parchment. Trim any excess pastry from the edges using a sharp knife. Beat the one extra egg and, using a pastry brush, brush the egg wash over the base of the pastry, return to the oven for 5 mins (doing this, you seal the pasty so when you pour in the liquid it does not make the pasty soggy). Whilst the pastry is in the oven for the second time, beat the eggs in a bowl, and then whisk in the milk & cream. Add your seasoning. When you remove the pastry from the oven, allow to cool for a couple of minutes; reduce the oven temperature to 160c. Place the grated cheese directly, and evenly, onto the pasty, add the lardons/bacon and then pour over the egg & cream mixture. Finally, sprinkle with the thyme leaves – pop back in the oven and back for 30-40 mins. You can serve straight from the oven or allow to cool and eat later; it will also freeze (in slices) and can be re-heated at 180c for 10 mins.